This month Team Bride was invited to help a lovely Lifford couple with their dream Wedding. I have known Shannon and John for many years and have been sitting in the hairdresser’s chair listening to Shannon’s plans and ideas over the last year and a half. Every hair appointment left Shannon with a new ‘To-Do’ list as I made sure to keep her focused!! All the planning and hard work paid off and we all enjoyed a fabulous day of sunshine and celebrations on July 8th. From all the conversations I’ve had with Shannon during the planning process it was always going to be about THE dress! She had a very set idea of what she wanted and apparently it was my job to make it happen! I remember her Mum Ann telling me that she felt sorry for me as I had my work cut out for me! But I knew straight away that Shannon would love the new Julie Vino Collection that was due to arrive exclusively to McElhinneys Bridal Rooms and invited them up to have a look. Shannon surprised everyone when she declared ‘this is it!’ from behind the curtain. 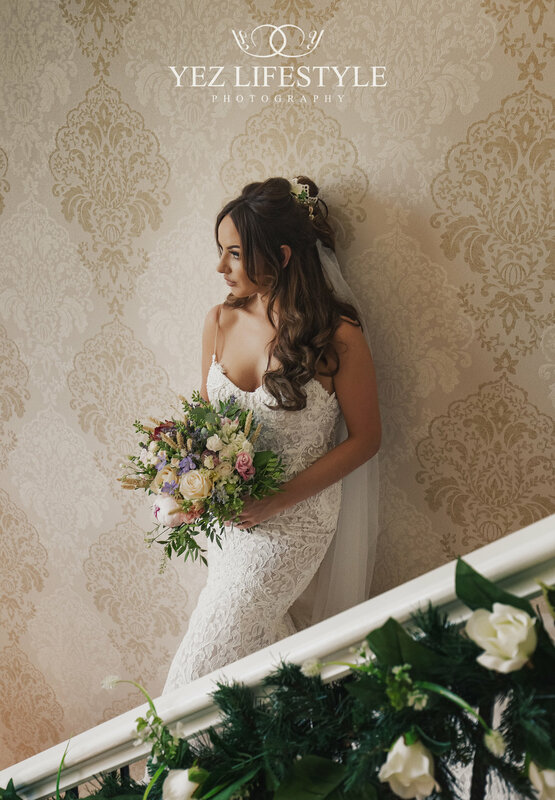 It was only the 3rd dress and nobody was as shocked as Ann to hear the words come out of Shannon’s mouth but when we pulled back the curtain and everyone saw how stunning she looked everyone agreed that this was indeed ‘the one’! We complimented the dress with a two-tone veil and a bespoke headpiece from Sass and Halo. With the dress chosen it was very easy for everything else to fall into place. The fabulous black-tie wedding was planned and Shannon sourced the most stunning bridesmaid dresses from Dubai and John and his men looked very dapper in fitted black tuxedos. The Mother of the Bride was stunning in a full-length blush and off-white dress from Cilento while the Mother of the Groom looked super stylish and elegant wearing off white. The morning of the wedding was surprisingly chilled out and I loved being there to help Shannon and her girls get ready. I had a little tear in my eye when I saw the stunning flowers from Tiger Lily and just how cute the flower girls looked when they greeted me at the bottom of the lane. The fabulously talented Mustafa from Yez Lifestyle Photography was on hand and joked that I am at as many weddings as he is these days! With a fab sunny day we had lots of photos at the house before Classey Wedding Cars arrived to take the Bride and her Dad to the church in a stunning Vintage Bentley. I made sure to pack our Team Bride Photo Picnic into the boot for the Bridal Party to enjoy during the photo session. Arriving at Murlog Chapel the nerves set in for Shannon when she saw the crowd of people waiting outside to get a peak! The nerves melted away as she walked up the aisle to see John standing there waiting for her alongside their eldest son Jacob (young Caleb was busy breaking hearts with his cuteness as he escorted the Mother of the Bride up the aisle!). The church was decorated with a stunning floral arch and pew ends from Lily Annabella and Michelle Feeny provided the most gorgeous soundtrack to a perfect ceremony. The Wedding was just wonderful from start to finish and I could write about it all day but I fear I may be boring you at this stage!! Thank you, John and Shannon, for allowing me to be involved in your big day, I wish you and your gorgeous boys a life of love and happiness.